A 5-star Dubai hotel became engulfed in flames as the city was preparing for New Year’s Eve celebrations, injuring 16 people. 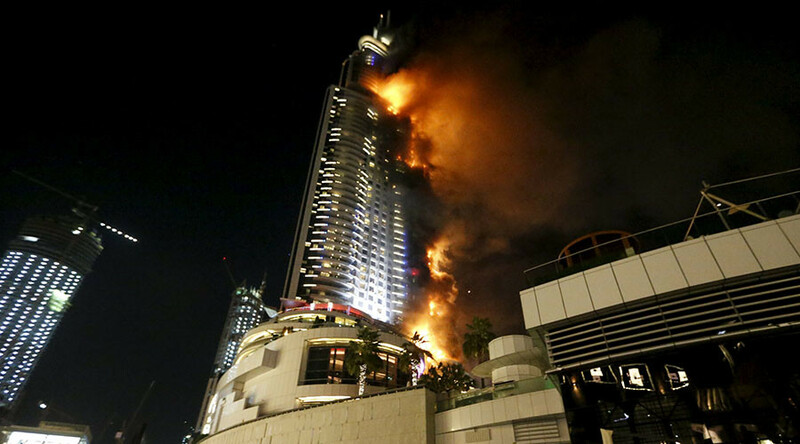 Firefighters battled to bring the fire under control at the 302-meter tall Address Downtown Dubai. It was not immediately clear what caused the fire, which covered at least 20 stories of the building near the Burj Khalifa, the world's tallest skyscraper. Burning debris rained down from the building as firetrucks raced to the scene. Al Arabiya reported that one person was killed during a stampede in the process of evacuation, however this information has not yet been confirmed by officials. Eyewitnesses told Sky News that firefighters’ access is complicated by the structure of the complex and crowd congestion. Civil defense representative said that all residents have been evacuated, and people are being moved out of the Dubai Mall located nearby. The fire engulfed the hotel from the outside and did not spread inside, according to Dubai’s media office. Officials said that the firefighters have sustained most of the fire, however have not yet extinguished it completely. As the building just caught fire, panic was reported in the area around the hotel and social media users posted videos of people running away from the scene in crowds. The Address Downtown and residential compound has nearly 200 rooms and over 600 apartments. The hotel is situated about 2km from Burj Khalifa, one of the sites of New Year’s festivities. “It's pretty scary stuff,'' Chris Browne, a tourist from London, told AP. Stuart O'Donnell, a British intensive care nurse in Dubai, said that the building was a prime location for those who wanted to see the fireworks display. "You feel sad for the people inside... It spread so quickly when it started,'' he told AP. Dubai’s grand New Year celebrations and fireworks proceeded as scheduled despite the massive fire that still continued to burn nearby. Earlier officials said they planned to go ahead with the festivities, which include three displays beginning at the Burj Khalifa. The skyscraper is decorated with 400,000 LED lights, while the fireworks display will feature 1.6 tons of pyrotechnics. In February, a massive fire broke out in the Marina Torch, a residential skyscraper at the Dubai Marina. The residents were evacuated and no fatalities were reported in that incident.